There are many factors that come into play when choosing the medium for your next designer jewelry piece. Aspects such as price, color, durability, and aesthetic appeal are just a few of the characteristics we must consider during the selection process. Now you all must be wondering if there’s a premium choice, a choice that can be created for a variety of price ranges, color schemes, and so forth. I believe there is. Let me fill you in on boulder opals. Boulder opals are found embedded in the brown ironstone masses of the Australian landscape, and have been named as high as the 5th most popular gemstone in the world. They have a unique, conventional nature, and can be found in all colors across the spectrum. How durable are boulder opals? The dry Australian origin allows these particular opals to possess a very low water content, and therefore be less prone to cracking or crazing. If a boulder opal is going to crack, it will most likely do so during the cutting process, thus assuring that the material making its way into your pendant is of the utmost quality in terms of durability. Are there different types of boulder opals? How are the opals extracted? Boulder opals come in two types, known as seam opals and matrix opals. Seam opals are removed where cracks are present in the ironstone slab. Bulldozers are used to break apart the ironstone, though a large hammer will suffice in some cases as well. The opal in question is then found and removed from the broken pieces of ironstone rock. 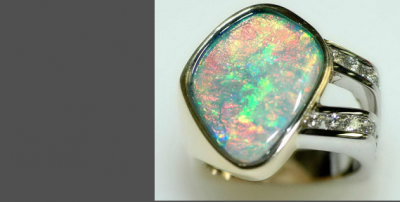 Matrix opals, on the other hand, are located where the opal flows randomly through the rock. 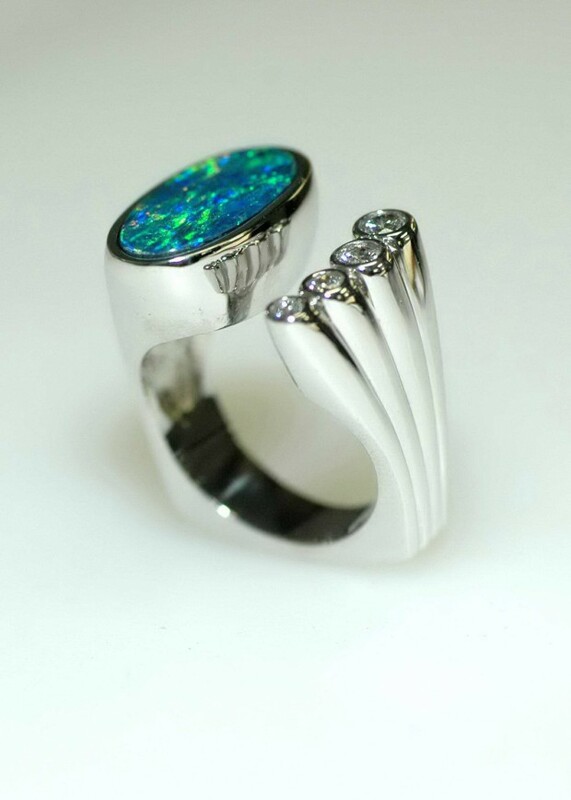 The stone itself is then cut and polished, revealing the matrix opal inside. That’s all well and great, in terms of longevity and retraction process, but what about the color? Boulder opals are very unique, in the sense that they come in an abundance of different colors. From greens and blues, to purple tints and orange shades, you’ll be sure to find the perfect rock for your ring, pendant or earring. Each individual boulder is formed inside a natural ironstone slab, making the possibilities of color unique and endless. Stop into MB Jewelry Design today and learn more about boulder opals, and find out how we can help develop your next favorite piece of unique jewelry!